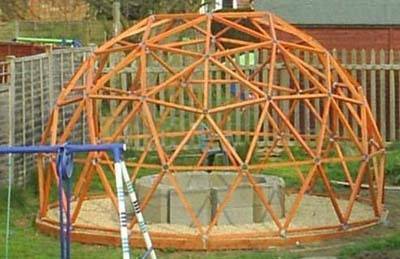 This is a great technique for building a tubular dome framework, much nicer and more flexible than the flattened conduit method but still simple to build. The hubs are real easy to make all you do is take some large diameter metal tube cut it into short lengths and drill the appropriate number of holes evenly around the side. The only thing you’ll need to be careful of is making sure the tube is big enough so you can get a spanner in to tighten the bolts when you come to assemble the dome. This method uses tubing with a flattened end like the flattened conduit method but instead of overlapping the ends a hub is used at each vertex. This has many advantages not least being able to take one strut out at a time. The only downside is that you’ll need five or six times as many nuts and bolts, what the heck bolts are cheap anyway. Make sure that the pipe used for the hub is of sufficient diameter to allow up to six connections and still get the spanner in to tighten the bolts. Use the Dome calculator to work out the strut length, remember that the calculator shows the vertex length, which is centre to centre of the hubs, so you will need to make allowances for hub diameter and bending the strut. Hi Paul A car bottle jack coupled with two steel channels and two 20mm threaded bars makes a good conduit squisher. 3" dia tube is a good size for hubs, use a socket on a ratchet for tightening the bolts. it`s much easier on the wrist ;) Here`s my (soon to be recycled)14ft dia. hub & strut 3v dome. It`s made from timber though, not steel conduit. Very good example of a strut a hub dome, using a piece of pipe as the hub - Thanks for sharing your picture Colin. Looking at the picture of Colin's dome, I am wondering how are the timber struts connected to the hubs? There wouldn't be enough space to connect from inside the tube surely? Colin sent this answer for you Dennis...Hi Dennis Perhaps the struts and hubs look thinner in the photo than they really are? The strut thickness dictates the minimum diameter of hub you can get away with using. 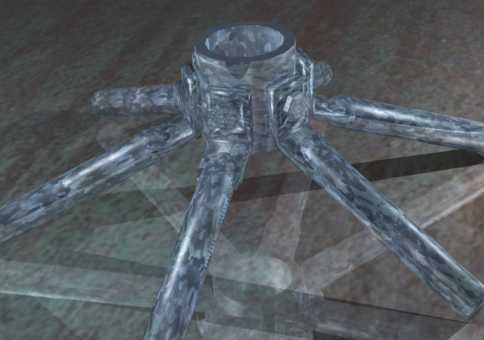 You will need to be able to fit up to 6 struts around the tube perimeter comfortably. The struts are connected to the hubs via M8 wood/metal dowels, which are basically a woodscrew thread on one end and a M8 machine thread on the other. They are screwed into pilot holes drilled into the strut ends so that just 15mm - 20mm of machine thread protrudes. Then it's a simple task of placing a washer and nut on the thread after inserting it into the hub and tightening it up with a 13mm socket. There's plenty of room inside the hub for the ratchet and socket. Colin's dome looks wonderful! Are the ends of the struts angled where they attach to the hubs or is there a bit of "wide tolerance engineering" designed in? Yes, I plan on building one, I just need to work out the cost of materials (I'll probably go with a 2v to keep the cost down). Perfectionist I ain't, so flat ends on to the hub will be fine :) I just need to decide on a hub material, are the hubs in the one above steel pipe? I'm not sure what will be available locally, but I'm sure I'll find something suitable. I'd like to see the construction of the hub on the suspended canvas dome, looks like a good option with a low profile for covering from the outside with less stress on the canvas. Thanks! Collin, could you send me a close up picture of the hub or tell me how you figured out where to drill the holes? Collin, I want to make a 3v type 12 to 16 feet in diameter... the one you built looks really nice,,, can you ask how you made it? are there any books that have diagrams etc?